b) the beauty and wonder of this region are actually way cooler than checking out some old cranky bloodsucker. Romania is a land where magical forests are everywhere, ancient castles are open to history buffs, and the Black Sea is just waiting for bikini and swim-trunk-clad tourists to rest on the beach. Romania should be far up on the list of awesome places to visit in Europe but it usually falls towards the bottom, unfortunately. 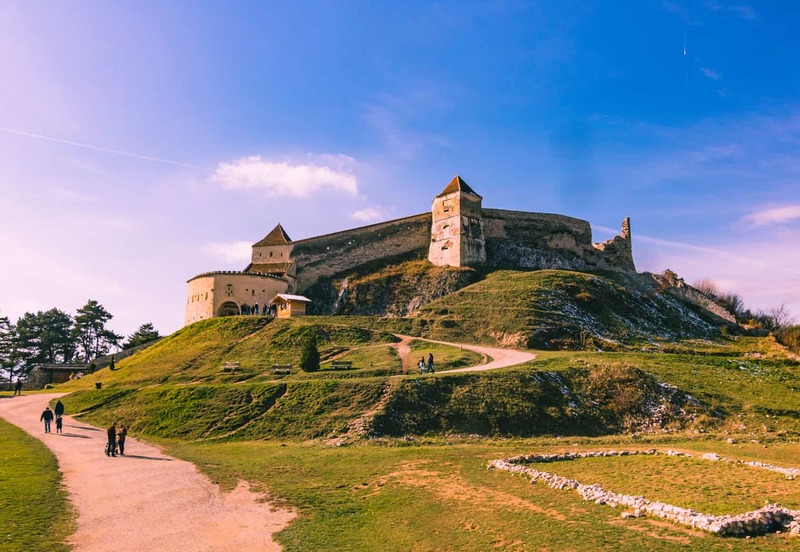 Hopefully, this post will change your mind and what better place to convince you Romania is worth checking out than the one place you’ve thought only existed in a book? Transylvania! Looking for real, non-fictional, things to do in Transylvania? I got your back. 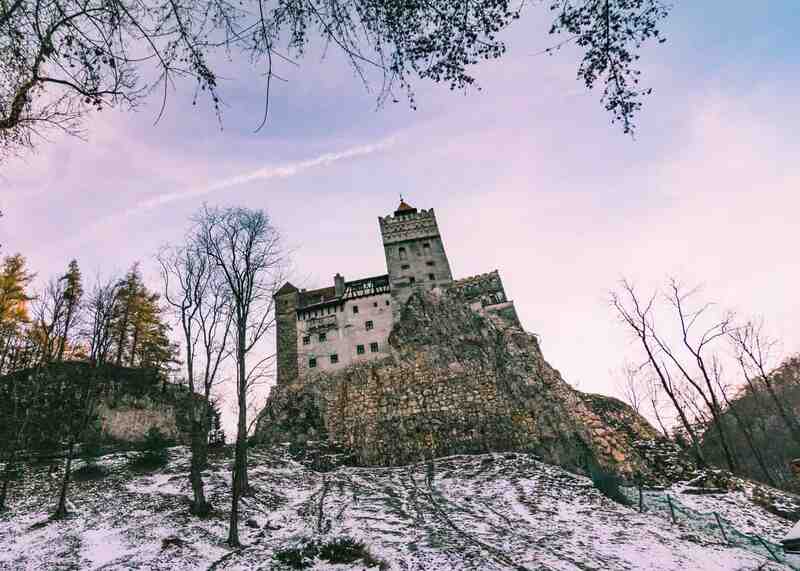 There are some seriously cool places and Transylvania tours to take during your visit. So a great author with an amazing imagination combined a bit of history (Vlad the Impaler) with a bit of supernatural fiction, and Dracula was born. Bram Stoker planted his main character smack dab in the middle of a mystical place full of conflict and war, romance and rebirth. And somehow, Bran Castle in the city of Brasov became associated with the fictional count when there’s not even any mention of Bran Castle in Stoker’s book at all. Bran Castle from the inside—probably THE most popular thing to do in Transylvania. Transylvania is a region in Romania, a Baltic state in Central Europe that has been torn apart, divided, annexed, and put back together so many times that its maps resemble a mosaic. But today, after a bunch of battles and land disputes by kings and dukes and czars, Romania stands as a tribute to survival and triumph. Gypsies and Jews, Roman Catholics and Romanian Orthodox, Hungarians and Romanians, you’ve got a nice big mix of a little bit of everything here. But alas, no Dracula! Sorry kids. Happily, there is still much to love and tons to explore. Transylvania is made up of a dozen little cities. 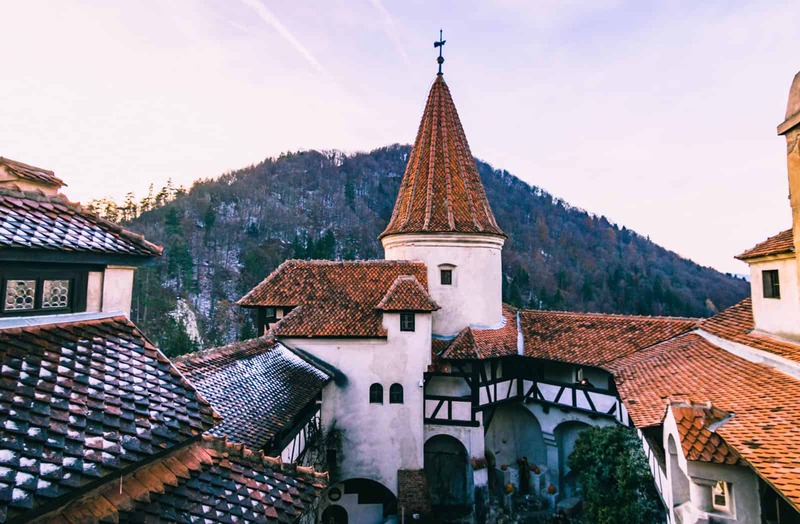 Each one has its selling points, so if you’re in the area or headed there, and you don’t know where to go in Transylvania, read on for your official Transylvania itinerary. Targu Mures is a central location in Transylvania. It sits on the bank of the Mures river and at the center of three different river valleys. The main attraction here is the architecture. The Palace of Culture is a centuries-old building with stunning stained glass and a brilliant concert hall. Since it’s located in the city center, you won’t have any trouble finding it. Salina Turda Mine, a certainly unique Transylvania tour. If you’ve got some time in your Transylvania itinerary, take a day trip from Targu Mures over to Salina Turda. You’ll go underground and find salt mines that have been excavated and mined for table salt for over a thousand years. It’s a “see it to believe it” kinda place. 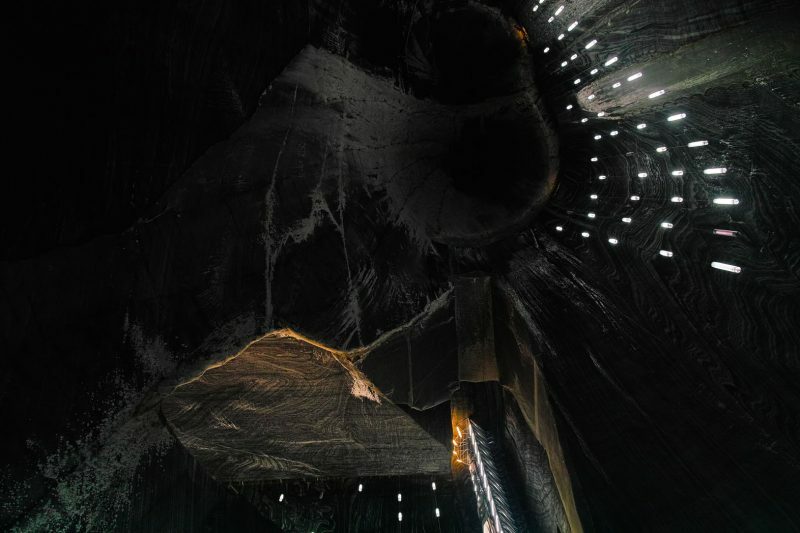 Click here to see prices for a tour to Salina Turda. Note: DON’T get mixed up and end up at the Praid Salt Mine. Unless you have children with you, this place will be disappointing. Sibiel is a tiny quiet village that you probably wouldn’t think twice about if it wasn’t for the two-story museum of icons on glass. Zosim Oancea houses what is likely one of the largest collection of religious figures painted onto glass. It would be fascinating whether you’re devoutly religious or a confirmed atheist. Just remember, this is a museum of history, not art. You’re not gonna find any DaVinci or Raphael here. However, the best thing I got to do here was be a part of a Romanian wedding! No, I promise, I didn’t crash any local’s big day, this was an organized event to show foreigners what a true Romanian wedding is like! THIS is the kind of experience many tourists, perhaps like you, would want to experience. Sure a real Romanian inviting you to their real wedding is great but that’s a less likely event. 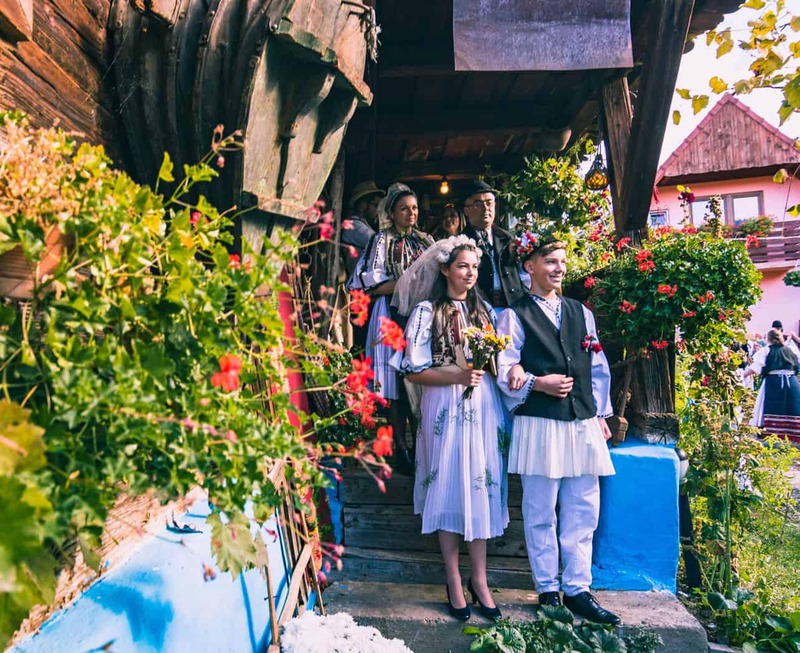 We did everything that a traditional wedding would have including going house to house with the groom looking for the “kidnapped” bride snacking and drinking at each place we went to, and dancing in the quaint backyards of random village homes. My wedding getup. This outfit is from the Bitristsa region! After we finally “found” the bride, we partied, ate, and danced some more! Definitely one of the coolest things I’ve done. Oh, and I even got to dress up! 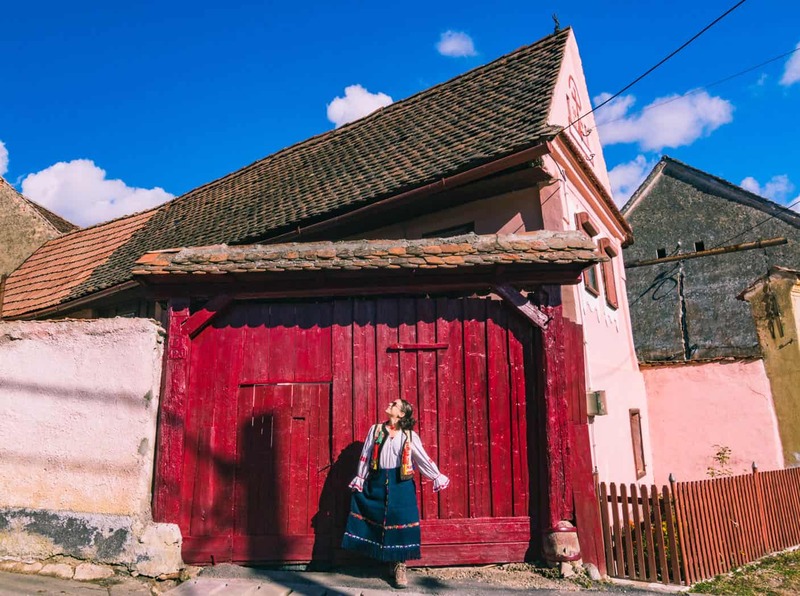 Sibiu is home to an outdoor village museum called Astra. Roam these quaint hills and you’ll see the way Romanians have lived for over a thousand years. It’s literally like taking a trip through time; they’ve got different styles of houses (floating houses!) from each time period, and they’ve even brought in domestic animals to add some authentic spice. 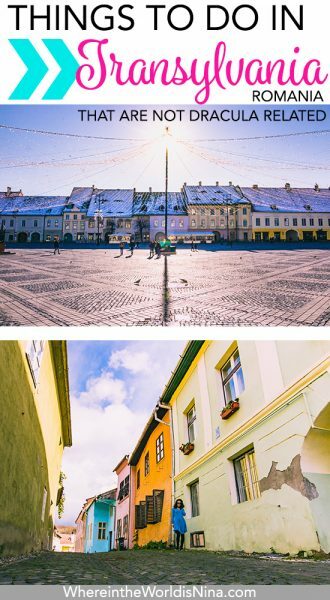 How cute is Sibiu? Look at the eyes! And the sunburst and snow on top of the roofs make this one of my fav pics from Romania. While roaming the city, keep a lookout (pun intended) for something interesting about the homes here. They have eyes! Check out Siebel and Sibiu on a day tour. Click here for the tour. 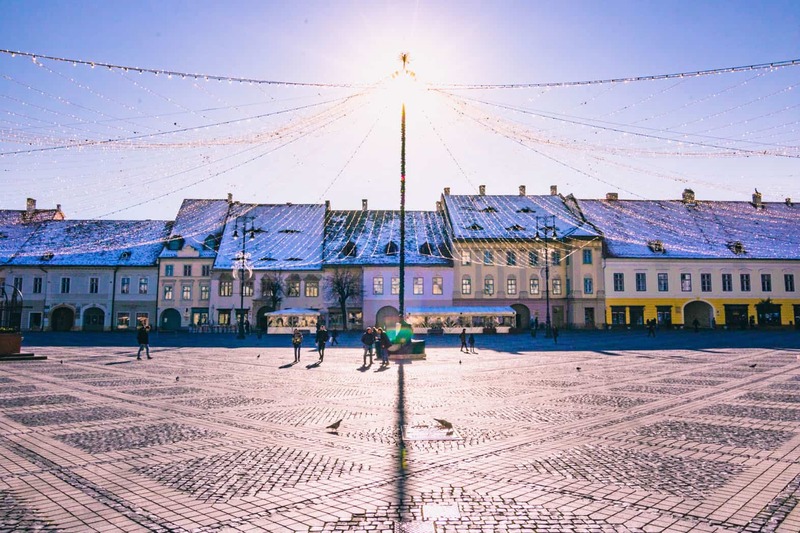 If you only have time for Sibiu, click this cheap and excellent tour that will show you everything you need. 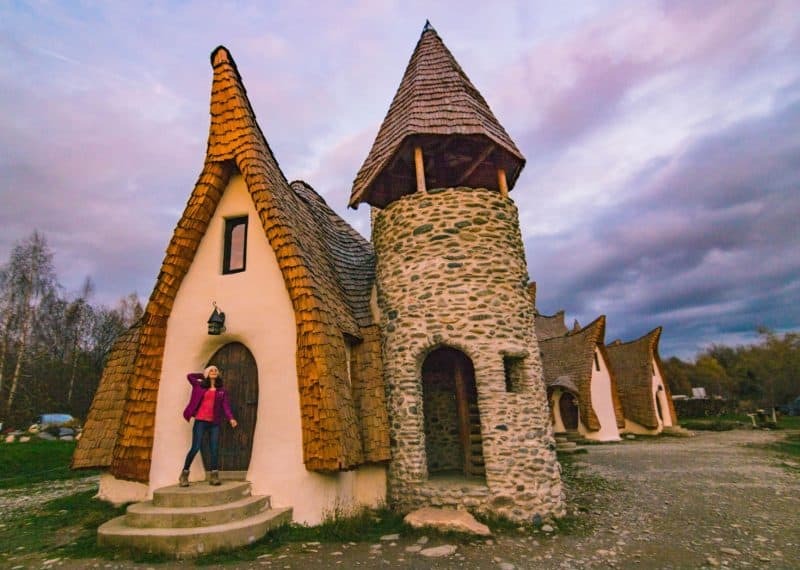 Just outside of Sibiu is also an adorable hobbit-like home called Castelul de Lut Valea Zanelor. It’s a soon-to-be-open eco-friendly hotel but is open now to wander around and play in a hobbit-inspired fantasy. Pretty much nothing but say “aw!” because this place is just so darn cute. Sighisoara is just a super cool place to hang for a day. Vlad the Impaler was born here, so if you haven’t lost your lust for Dracula info, there’s that. 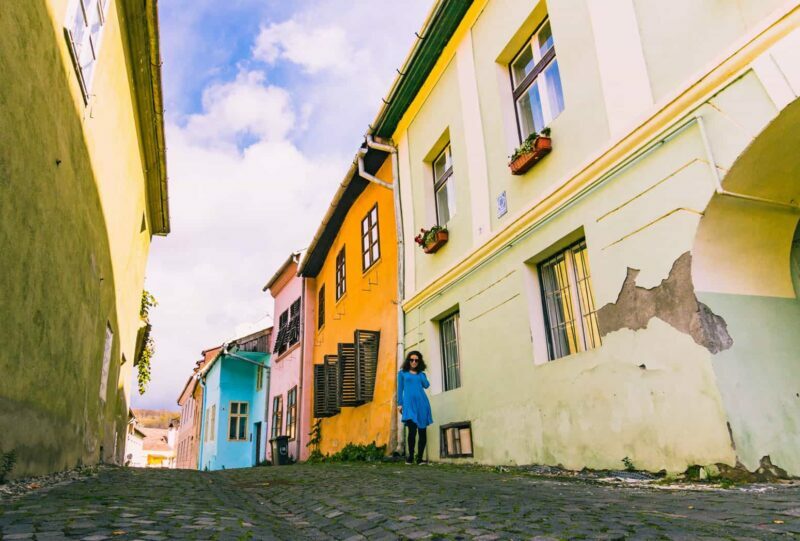 Otherwise, wander and get lost on the vibrantly drench streets of this Transylvania town. They are so colorful because they were used to identify the homes instead of the number and street name system we have now. 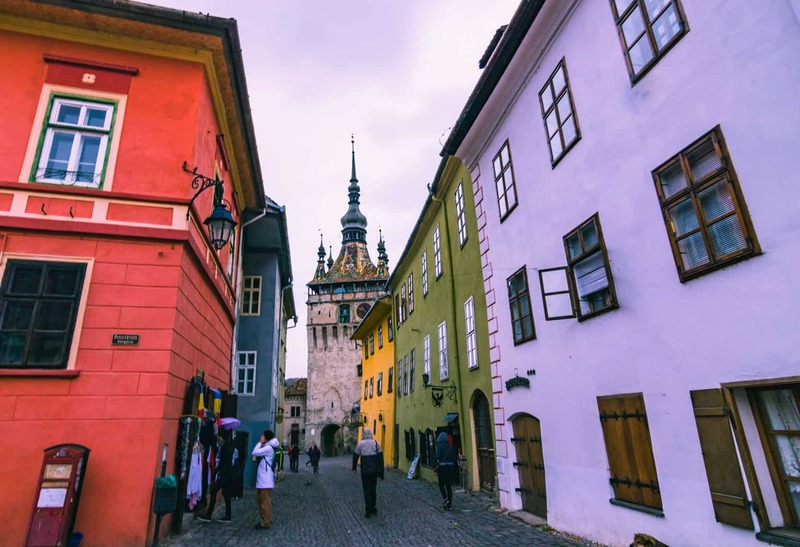 Sighisoara! You’re so cute! The first pic of this post is also from this adorable town in Transylvania. Otherwise, climb up the clock tower and take in the gorgeous panoramic view from the top. There’s just something about wandering through a town that has been around, and thriving, for hundreds of years. Take a quick and cheap walking tour of the city to get to know it more and find all the best spots for photos. Click to book the tour here. Castles, castles, castles! Bran Castle makes its home in Brasov, and Rasnov is a city snuggled up next to Brasov. Grab a tour of both cities, and you’ll get to wander in and out of castles for a day or two. You’ll get a taste of medieval life, enough history for a lifetime, and views that you can lock into your memory, both digital and mental, forever. 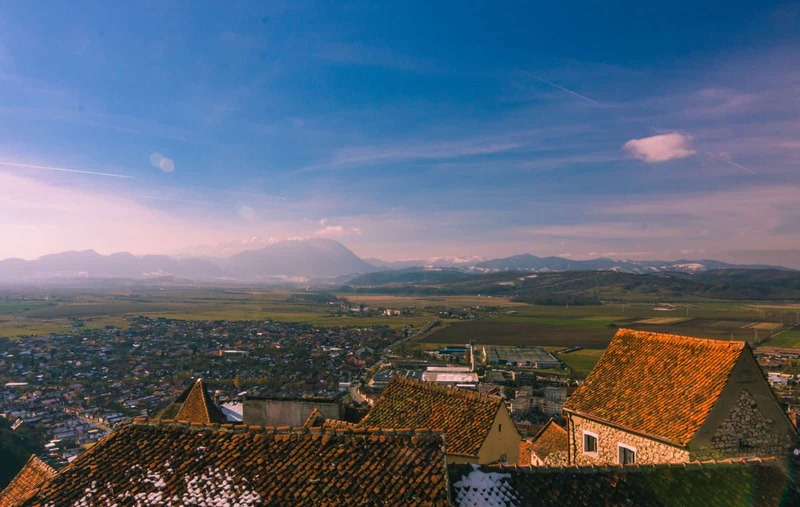 While wandering around, these two adorable towns, check out Rasnov Citadel for a beautiful ruinous castle with a few tourist stalls inside but also great views of the surrounding area. For even better views, check out Turnul Alb in Brasov. You’ll get to see all of Brasov, the mountains, and even the big Hollywood Brasov sign. Can you see the Brasov sign? While I want this post to show you that, first, Transylvania does exist in real life, I also want to show that there’s way more to it that Dracula. BUT I guess I have to tell you that Bran Castle, AKA Dracula’s Castle, is located here! Yes, it’s beautiful and it’s worth a visit, just don’t ONLY go to Bran Castle, promise? Interested in seeing more of Brasov and Bran Castle? 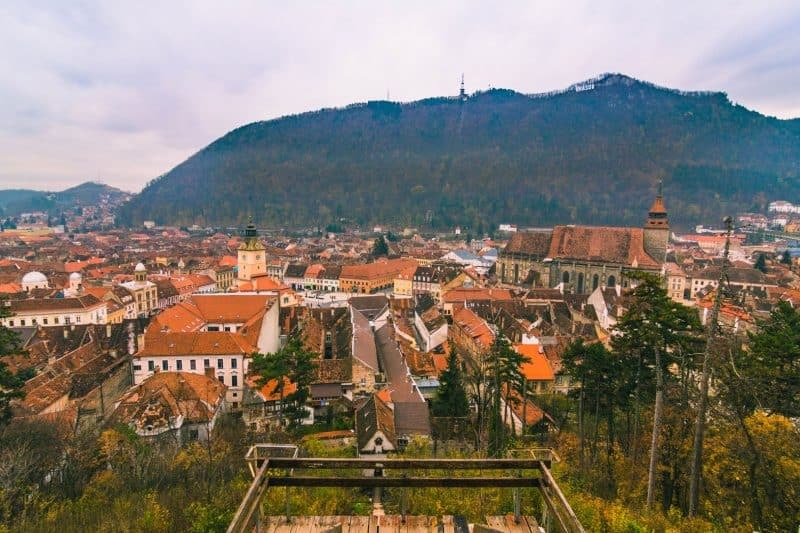 Click here for a recommended tour or just check out Brasov itself with this informative guided tour. Two words: mountains and lake. 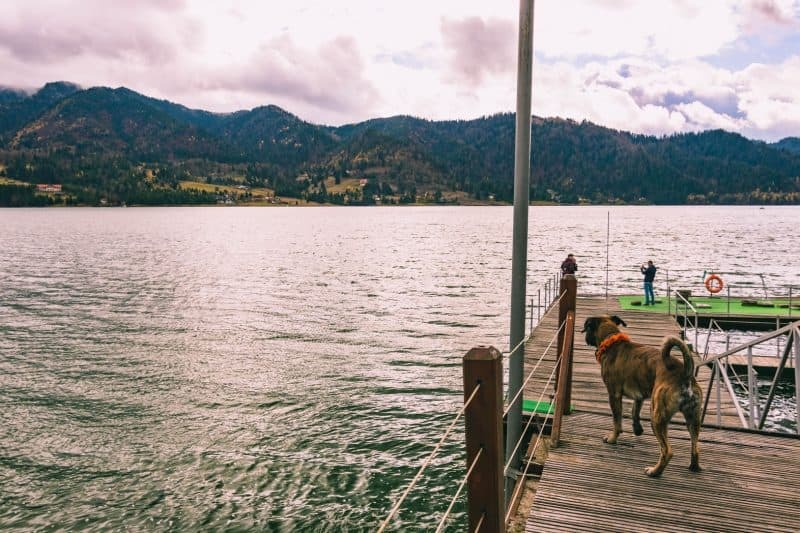 For my nature lovers out there, Colibita is at the top of the list of things to do in Transylvania. Grab a cold beer or a glass of wine at Fisherman’s Resort and just bask in the fresh air, the magnificent view of the lake, and the hulking mountains. If you’ve spent most of your Transylvania itinerary walking, hiking, and touring, Colibita is a great last stop. Life goals for next time I visit: Drive the Transfagarasan Highway! I visited when it was still snowing so driving here wouldn’t have been much fun or feasible. In fact, it was closed when I was here (October). So keep this in mind when traveling around and thinking of things to do in Transylvania. By the time you leave Transylvania, you’ll be wondering why you ever thought it was all about some made up vampire. Especially for Americans, it can be hard to imagine villages that have been standing for hundreds, if not thousands, of years. Romania, and Transylvania specifically, is a fantastic reminder just how small we are in this world and how timeless and treasured these cities are to us all. Are you planning a trip to Romania? 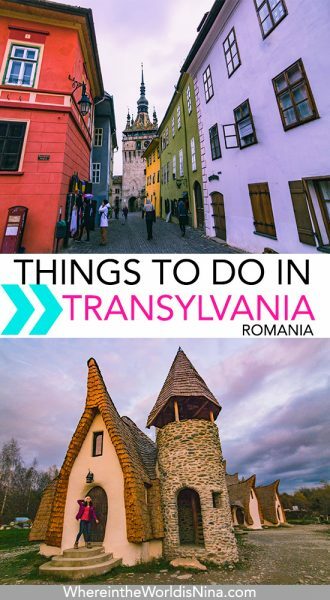 Which of these Transylvania tours are you most excited for? Don’t lose this post! Click the picture and pin it for later. Hi, may I know when is the fall foliage peak season? Am I going to miss it if travelling between 26-29 October? Hi Nina, my name is Alejandro.. I’ve always dreamed of visiting Romania and specially Transylvania and yes, Dracula is/was part of the fantasy :-)… Since I’m coming to Europe in Dec and will be roaming around in Europe for sometime I decided that its time I visit Romania.. I’m planning to come in January as cold as it may be.. so planning to visit Bucharest over the weekend (for a couple of nights) and then head to Transylvania during the week for 3 or 4 nights… I already know that I want to visit Brasov, with only 3-4 nights is/are there any other must do places that you recommend the most? since there are so many to choose from in your post.. and also, how easy is it to move around from town to town, and any recommendations on where to stay? Hi Alejnadro, Sibiu and Sighișoara both aren’t far from Brasov. You could take the train to either of them. Both are super cute towns.